Fifth and final installment by sociologist Dave Horton, from Lancaster University, as a guest writer. Dave has written a brilliant assessment of Fear of Cycling in an essay and we're well pleased that he fancies the idea of a collaboration. We'll be presenting Dave's essay in five parts. I am now switching from thinking about a fear of cycling which is produced from constructions of cycling as inherently dangerous, and thinking instead about how the identity of 'the cyclist' tends to invoke fear. There is undoubtedly scope for using psychoanalytic theories here, and in particular ideas to do with projection and transference. But I do not venture far into that territory in the remaining part of this chapter, and draw instead on Georg Simmel’s classic sociological account of the stranger (1971), as well as more recent sociological work on stigma (Goffman 1968), stereotyping (Pickering 2001) and scapegoating (Cohen 2002). In the UK during the twentieth century, cycling gradually moved from being a major mode of mobility to being a minor one. As the volume, speed and dominance of motorised vehicles grew, cycling was designated ever more marginal road space. We have seen that the impulse to altogether eliminate cycling from the road only succeeded on motorways, for which cycling organisations campaigned. Nevertheless, cycling was everywhere else reduced to a practice taking place on the edges of a transport infrastructure which increasingly centred on the car. Automobility's massive power is well expressed by its current monopolization of space. The seemingly taken-for-granted dominance of automobility saw UK cycling in a perilous state across the latter third of the twentieth century.6 By the century’s end, cycling was spatially in the gutter. The spatialities of a practice always have implications for people's identities (Lefebvre 1991; Shields 1991; Sibley 1995). If cycling was spatially in the gutter, then so were cyclists' identities. Cycling, and most especially urban utility cycling, had become a polluted and polluting practice and ‘the cyclist’ a polluted and polluting identity. The cultural acceptability of cycling's spatial marginality, particularly when combined with the cyclist's stigmatised identity, is highly consequential. It means that those cyclists who do not stick to the margins, but either consciously or unconsciously attempt to 'centre' themselves, are experienced as threatening and unsettling, and are demonised - most visibly and powerfully within the mass media. So cyclists' collective protests, such as Critical Mass, are particularly vilified (Carlsson 2002). But even the least ‘political’ of cyclists will sometimes break from the invisibility of the margins and therefore inadvertently challenge automobility's spatial monopoly. This cyclist can execute a whole range of manoeuvres designed to take short-cuts, avoid hold-ups and escape danger. It should be stressed that many such movements, whether actually ‘illicit’ or simply unavailable to people in cars, are risk reduction strategies, tactics developed by cyclists to reduce conflicts and risks of collision with others. But unlike road safety education, helmets and new cycling infrastructure, many are not officially sanctioned and are therefore not regarded as wholly legitimate. Those very same tactics which have enabled cycling to survive as an urban practice can also therefore reinforce the cyclist's already stigmatised identity. The mass media is very alert to the potential of the cyclist's stigmatised identity to make 'a good story', especially in a social context which increasingly encourages people to reflect on transport choices and question their own automobilised lives (see below). Newspaper editors are attuned to knowing what their readers and advertisers want (and we should note how a high proportion of those advertisers belong to the system of automobility, on whose revenues newspapers depend). Media accounts are therefore likely to reproduce dominant representations of the cyclist as a 'yob', law-breaker and outsider (for example, Hoey 2003). Such stereotyping works by isolating certain behaviours, stripping them from their meaningful context, and attributing them to ‘everyone associated with a particular group or category’ (Pickering 2001, 4). And these stereotypical representations contribute to the maintenance of the cyclist as a strange 'other' (Basford et al 2003; Dickinson 2004; Field 1996; Reid 2004). Against the context of socially and ecologically destructive automobility, the reproduction of concerns about cyclists’ behaviour is a classic example of scapegoating (Cohen 2002). Scapegoating deflects attention away from greater crimes, by in this case sacrificing the cyclist in the ideological pursuit of ‘motoring-as-usual’. Through representing the marginal practice of cycling as ‘deviant’, the dominant practice of car driving is reproduced and reaffirmed as ‘normal’. Representations of cycling as deviant and cyclists as outsiders both contribute to, and are facilitated by, low levels of cycling which mean that few people are able to take, and defend, the cyclist's point of view. But times are changing. Cycling has become strange, and the cyclist has become a stranger. Yet there is an intense ambivalence about the stranger (Simmel 1971). The stranger's presence suggests the possibility of another way. Against a backdrop of increasingly vocal concerns about climate change and growing unease about 'the car', the cycling stranger embodies the possibility of a different social order. So here is another challenge to cycling as a marginalised practice and the cyclist as a stigmatised identity. But this time it is not Critical Mass or aberrant cyclists who, by moving from the margins to a more central position, are issuing the challenge. It is governments. More accurately, it is transport discourse and policy, which especially in light of a range of social and environmental ‘problems’, is now pushing cycling back towards ‘the centre’. UK Government transport policy (most notably Transport for London) is recognising cycling as ‘a good thing’, and making it clear that people should give cycling a go. The mass media, albeit at its more progressive end, is also now representing cycling in more positive terms. On 7 June 2006, the front page of one UK newspaper, The Independent, featured an image of the front wheel of a bicycle alongside the headline 'Revolution! Britain embraces the bicycle' (Milmo 2006). For the last third of the twentieth century, the cyclist was relegated in favour of the motorist. But the cyclist is coming back. And again, it is experienced by many people as as a threat. The radical separation of the cyclist from the motorist within UK society returns as an unsettling haunting. The push to bring cycling in from the margins suggests that car-centred lives will not continue forever. Forcing an encounter with the idea of oneself as a cyclist, it provokes fear of cycling. So my argument is not only that a fear of cycling is produced by varied attempts to make cycling safer, but also that a fear of the cyclist is related to people's anxieties that they, too, might end up taking to cycling, and becoming a 'cyclist'. But cycling is pedalling in from these margins. There are - admittedly tentative - signs of a cycling renaissance. A range of actors is today seeking to elevate cycling’s position in transport policy, to move it into the mainstream. If this push continues into the future, we may well see people's anxieties, about change away from currently dominant automobility, increasingly projected onto the cycling stranger (Sandercock 2002, 205; Sigona 2003, 70). As people feel increasing pressure to get on bikes themselves, and thus really start to engage with the realities of currently dominant cycling conditions, we may also hear more cries that cycling is too dangerous. People's fears of cycling will become more real and powerful as the prospects of their cycling grow greater. And people will feel and fear the loss of a way of life as it has come to be lived, as automobilised. When these anxieties become intense and the calls that cycling is too dangerous become really vociferous, we should I think take them as a sign that - as a culture - we are getting really serious about once more getting on our bikes. In the meantime, what can be done to allay people's fears of cycling? 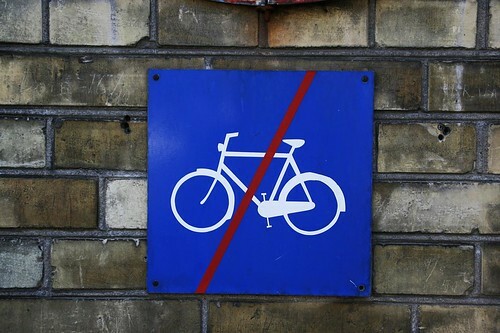 Although it is constantly produced and reproduced, fear of neither cycling nor the cyclist is inevitable. Both the conditions for cycling practice and representations of the cyclist can change and be changed, and thereby produce different effects. Many people who cycle today - racing cyclists, touring cyclists, cycle campaigners, bike messengers - belong to cycling cultures which produce and reproduce positive experiences and representations of cycling. These people may be aware of constructions of cycling as something to be feared, and of the cyclist as deviant and strange, but such negative representations are easily exceeded by the celebratory and confirmatory evaluations of cycling and the cyclist continually flowing through their specific cultural worlds. - Basford, L., S. Reid, T. Lester, J. Thomson and A. Tolmie (2003) Drivers' Perceptions of Cyclists (Transport Research Laboratory Report 549, Crowthorne: TRL). - Carlsson, C. (2002) Critical Mass: Bicycling's Defiant Celebration (Oakland, Ca. and Edinburgh: AK Press). - Cohen, S. (2002) Folk Devils and Moral Panics, third edition (London: Routledge). - Dickinson, J. (2004) 'Social Constructions of Tourism and Local Travel: Implications for Mobility in a Rural Tourism Context', in Proceedings of Tourism: State of the Art II (University of Strathclyde, Glasgow). - Field, P. (1996) 'Call it Slaughter', Cycling and Mountain Biking Today, December (accessed at http://www.motorcarnage.org.uk/motorcarnage/otherarticles/slaughter.html, 7/6/04). - Goffman, E. (1968) Stigma: Notes on the Management of Spoiled Identity (Harmondsworth: Penguin). - Hoey, K. (2003) 'The Real Menace on Britain's Roads are Selfish, Aggressive, Law-Breaking and Infuriatingly Smug Lycra Louts', The Mail on Sunday, 19th October. - Lefebvre, H. (1991) The Production of Space, trans. Nicholson-Smith, D. (Oxford: Blackwell). - Milmo, C. (2006) 'Revolution! Britain embraces the bicycle', in The Independent, 7th June, pp. 1-3 (available online at http://news.independent.co.uk/uk/transport/article656400.ece; last accessed 4/2/07). - Pickering, M. (2001) Stereotyping: The Politics of Representation (Houndmills: Palgrave). - Reid, S. (2004) ‘Fear and Loathing?’, Cycle, February/March, 29-30. - Sandercock, L. (2002) 'Difference, Fear and Habitus: A Political Economy of Urban Fears', in J. Hillier and E. Rooksby (eds), Habitus: A Sense of Place, 203-18 (Aldershot: Ashgate). - Sigona, N. (2003) ‘How Can a “Nomad” be a “Refugee”? Kosovo Roma and Labelling Policy in Italy’, Sociology, 37(1) 69-79. - Simmel, G. (1971) On Individuality and Social Forms, ed. and intro. by D. Levine, (Chicago and London: University of Chicago Press). - Shields, R. (1991) Places on the Margins: Alternative Geographies of Modernity, (London: Routledge). - Sibley, D. (1995) Geographies of Exclusion (London: Routledge).